A typical tour costs between £245 to £795 + vat for the photography, processing and publishing. The tour will be visible 24 hours a day on the business’s Google+ Local page, Google Maps and will feature in Google search results. The tours can easily be embedded in a web site and can also be added to Facebook. If you do not have a Google+ Local page we can set one up for your business please get in touch for quote. 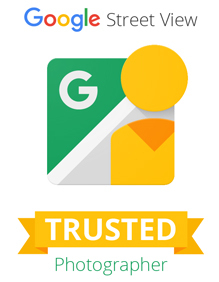 Your Google virtual tour is added to your Google Business listing with NO ONGOING CHARGES at all. No additional costs. No annual hosting fees.